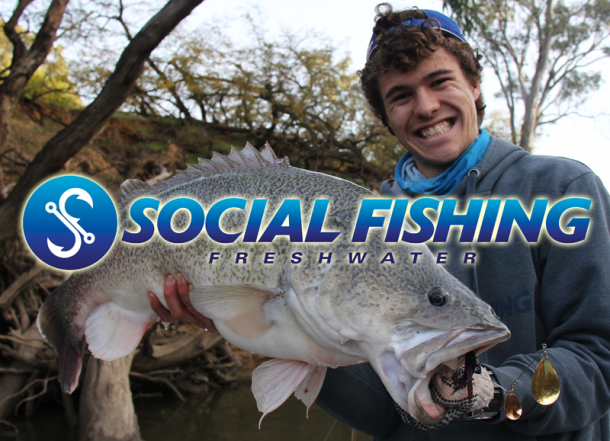 The surface market for Murray Cod has exploded in the past couple of years as this style of fishing has become more common. It’s not the most effective form of fishing in terms of numbers but the excitement of a surface strike far outweighs that of subsurface. The cracking sound and explosion sends the adrenaline pumping as they hit with such extreme power making your heart skip a beat every time. 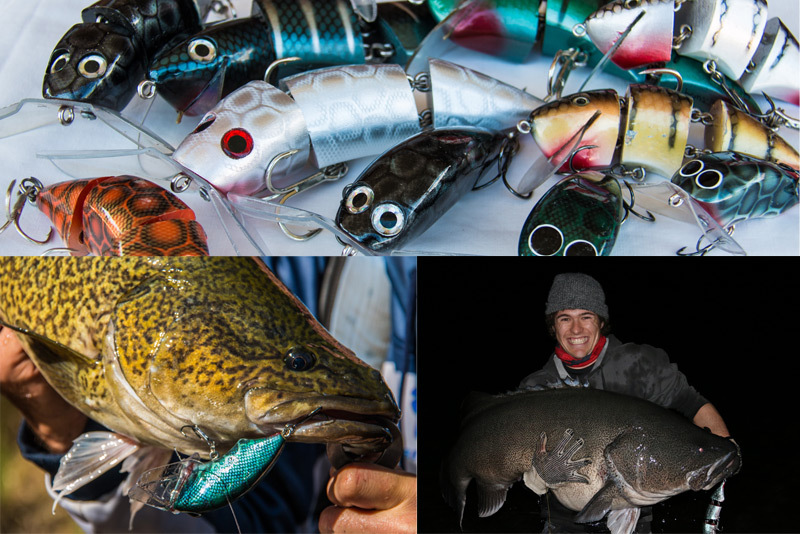 Now with so many lures on the market these days it’s hard to know which one to choose – until now. Gobsmacked lures have made this choice very easy. 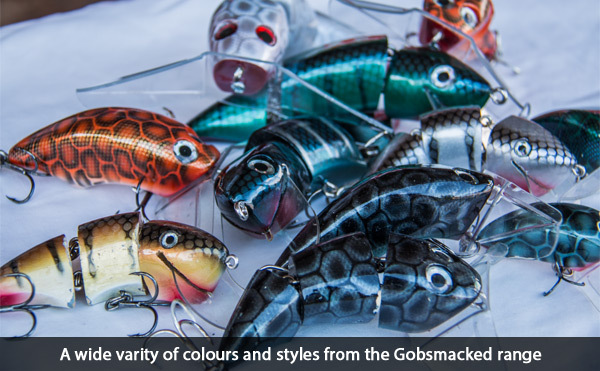 The Gobsmacked surface lure range is nothing short of cod quality, in every aspect. 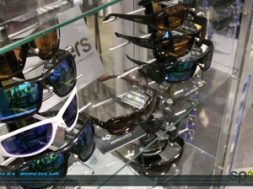 There are a range of styles and in this article I want to share with you my 3 favourite from the Gobsmacked range. 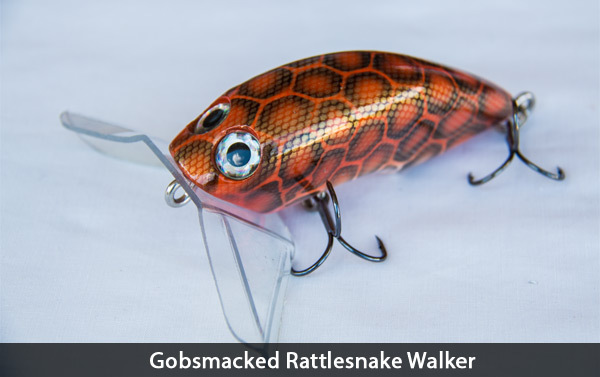 The Rattlesnake Walkers are your standard surface walker from Gobsmacked range. These are a relatively new model and have been designed and crafted to make an ultimate surface lure. The body shape is unique and adds to its swimming action along with the cupped bib design. This bib is unique and is angled in at the bottom and top which adds to the erratic action of the lure. 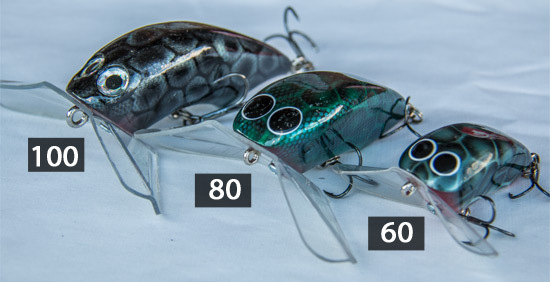 The same bib design is used throughout all the walker surface lures in the range. They come in 3 different sizes to cover a range of situation. 60mm: is a tiny surface lure in cod terms but even though small its gives off plenty of action. It imitates a small bug or insect very well with a loud and high pitched blooping action. 80mm: is the mid-range and my pick of the three sizes. This lure is perfect for smaller creeks and has landed us some quality fish. 100mm: has a larger profile and gives off even more action and disturbance. 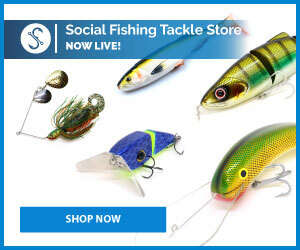 These lures are a perfect starting point if you are just getting into surface fishing and want an all-round lure. This is a new lure to hit the market for 2015 cod opening and I was lucky enough to test them before the season closed. All I can say is this is a must have surface lure. I tested the 175mm which is the larger of the two with the smaller one measures in at 125mm. 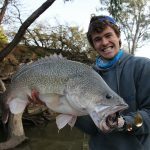 This test trip well and truly proved this lure worthy as it landed a 130cm Murray Cod in its first hour of the lure being wet. To this day the biggest fish landed on a Gobsmacked Lure and my PB cod. 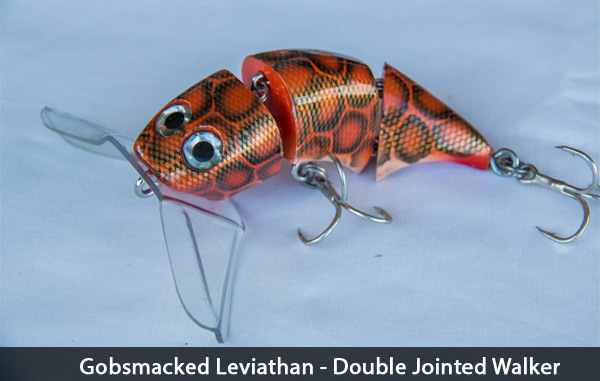 These lures are large with a long body that have extreme action in the water because of the double joint. This double break allows for a wide snaking action at the tail end of the lure as the front paddles across the top with a standard walker action. What’s even better about this lure is the double joint allows the back end of the lure to sit down in the water. Now this means the hook up rate is much better as the hooks are sitting further beneath the water. And also as they are a heavier weighted lure due to the size, which means they are more likely to get sucked down the cod’s gob rather than be pushed forward. Another feature of the double jointed lure that I haven’t seen on any other lure is the heavy duty double connection in the links/breaks of the lure. This gives you twice as much security when fishing for large cod a very important feature. 125mm: is a great all round size. We use them in small tiny creeks as a larger offering but they are still big enough for large rivers and even impoundments. 175mm: perfect for fishing for cod in dams. Large lure that attracts a lot of attention. 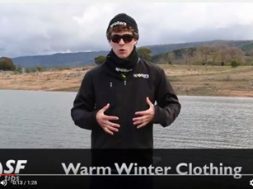 Perfect lure for dams like Copeton. The Gobsmacked Crank‘n’Stein Wakebait have only just been released and when it comes to wakebaits they tick all the boxes. 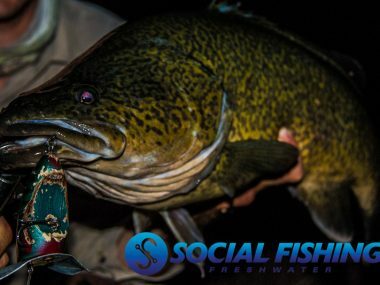 Wakebaits are an even newer style of surface lure to hit the Australian cod market and there aren’t all that many around. In saying that there is a need for one of these lures in every anglers tackle box. They produce a more subtle snake like action as they move across the water. They don’t produce noise like a paddler but they create a lot of water disturbance and this is what attracts the cod. These lures will work better when there are more lizards, snakes and mice around. Something that swims across the water’s surface trying to escape, rather than something flapping around like a bird or moth. 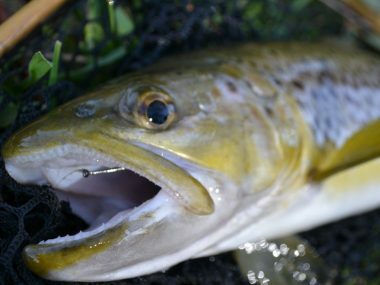 In any kind of fishing you want to match the hatch, this means use something that represents what the fish is going to eat. This Crank’n’Stein swims a few mm below the surface creating a bow wave effect in the water and that is why I love this lure! When it comes to surface fishing, the hook-up rate is always low. 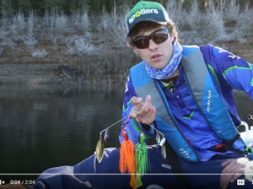 Much lower than any other style of fishing, but this lure will increase that rate as it sits slightly deeper in the water and closer to the fish. Therefore the fish will have more chance of taking the lure in rather than pushing it away, even more so than the double jointed walkers. Again these lures have the same reinforced join as the Leviathans. 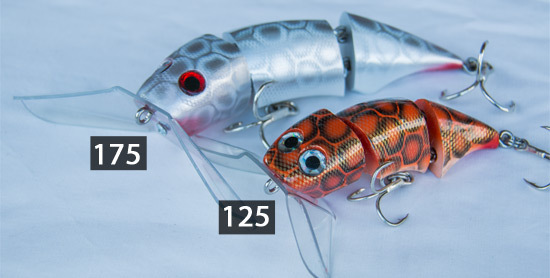 125mm: is a lure that you can use in all situations. A gun lure in the small creeks where you want to represent a mouse or snake making its way across the water. 175mm: is a perfect option again for the dam or in larger rivers when targeting big cod. This would be my go to lure when surface fishing in dams as it perfectly represents the lizards that are found along the rocky edge. For example Burrinjuck Dam is packed with Water Dragons which swim through the water constantly. This lure is a perfect representation. Another feature of these lures which puts them above and beyond is the quality and finishing. 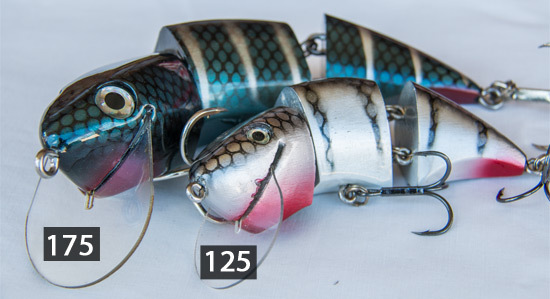 The colour patterns on these lures are second to none, with a snake like pattern in a range of different colours. From dark gun metals, to silver and white and golds; everything is covered. I especially like the darker colours in the range as they produce more of silhouette during last and first light. This helps the fish find and attack the lure with higher rate of accuracy. The white and silver colour is also the perfect representation on a mouse or anything with a white belly. Now I bet if you go out and pick 10 different branded lures off the shelf at random, 8 out of 10 will need to have their hooks changed. This is where most lure makers lose points with cod anglers. They make a great lure and put rubbish hooks on them which means we need to upgrade to stronger hook like Owners. 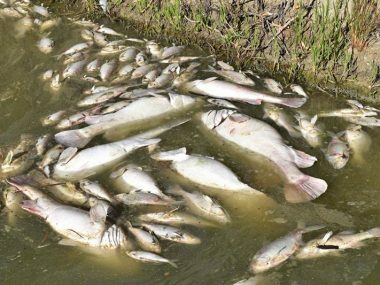 What is even worse is if anglers don’t change the hooks they are more likely to catch less fish. You won’t have this problem with the Gobsmacked range of lures as they come with razor sharp hooks. It is a must to have sharp hooks on surface lures and these lure come ready to go, matched with the sharpest and perfect size hook for the lure. This saves you the time, effort and money of buying and fitting your own hooks. A big thumbs up from all cod anglers! That is an overview of my 3 favourite lure from the Gobsmacked range. There are even more great models in the range which will also catch great fish like the old faithful Frog Walker. 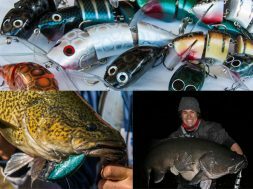 If you’re just starting out or have been in the surface game for a while make sure you swim one of these top Aussie lures. You do not want to miss out and I’ll guarantee you will be sold from that first boof!